The craftsman, the artist, the detective and the criminal are at times all driven by the same obsession for perfection and detail. The exhibition Double Je (Double Self) provides the backdrop for a storyline specially written for Palais de Tokyo by the crime writer Franck Thilliez. The exhibition not only recreates the workshops and living spaces of the two protagonists, but also constitutes the backdrop of a crime scene. The fruit of a collaboration between craftsmen and artists, the furniture and objects featured have provided the opportunity for numerous commissions. Together, they set the scene of the drama and provide clues, which invite the visitor to unravel the plot. After L'Usage des formes (The Use of Forms), this exhibition is the second part of the partnership established with the Bettencourt Schueller Foundation, to honour art professions and artists. 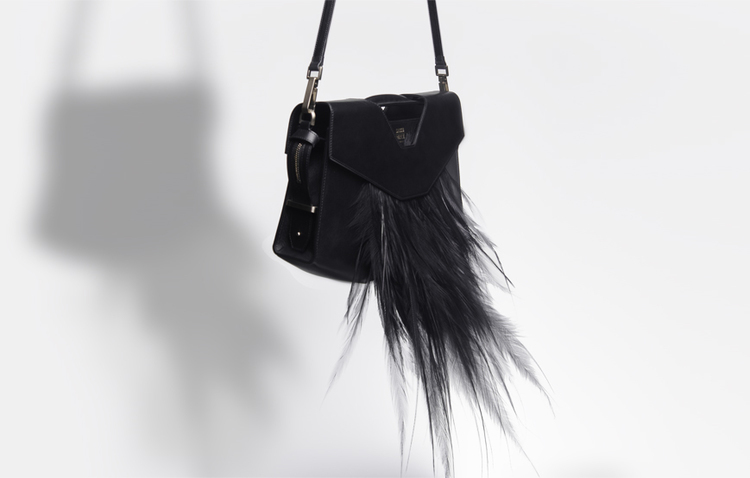 Maison Sacco Baret, together with M.Marceau are presenting specially created, limited edition feather adorned pieces for the PALAIS DE TOKYO. The pieces are creatively integrated into the Contemporary Art Center’s exposition titled “DOUBLE JE" —Artisans d’art et artistes. Open to the public from March 24th – May 16th, 2016 in Paris. TOP LEFT: Sacco Baret black leather Vendôme bag titled “TROMPE-L’ŒIL” adorned in an intricate marquetry of cream colored cockerel plumes. BOTTOM LEFT: Sacco Baret black leather Saint Germain unisex sneakers titled “ALTER ÉGO” adorned in iridescent cockerel plumes. BOTTOM MIDDLE: Sacco Baret black leather Vendôme bag titled “DOUBLE-JE” embellished with black vintage bird of paradise plumes, from the House's historical archives. BOTTOM RIGHT: Sacco Baret white leather Beaubourg unisex sneakers titled “L’ARTISTE” adorned in iridescent médaillon peacock plumes.